Loops is a celebration of light, movement and sound. It is an open end game that connects people. 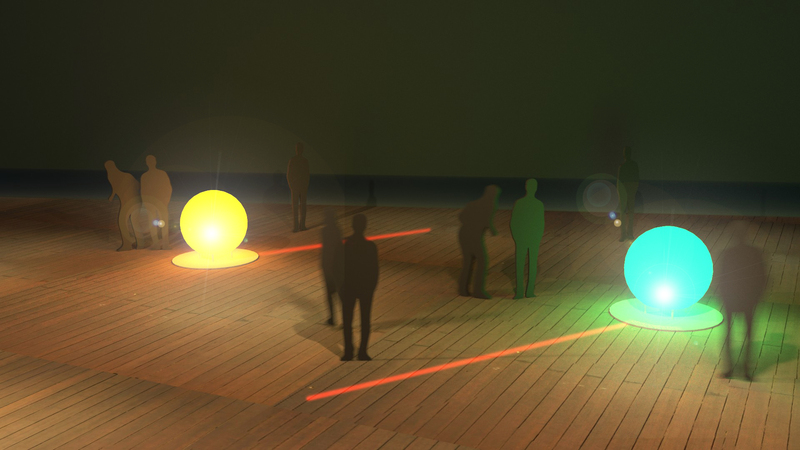 By gathering around the installation, like at a campfire, you are influencing the sound and the light of the installation. A laser line is rotating every second around the center balloon. Whenever it is detecting a person on its path it will change the sound and the light. The continues rotation of the laser creates the rhythm for the sound. With this installation we are changing a classic sound loop into an interactive playground. Loops exists out of autonomous light bubbles. Each bubble reacts to its environment through sound and light. Each bubble has a laser line that goes in circles to set the pace of the beat. When somebody stands on the line, the rhythm of the audio changes, along with the color of the bubble. More people, results in a more dynamic sound and light experience. It allows for an open-ended play, exploring the infinite ways to set the beat of the loops. A Loops bubble exists out of an inflated bubble, mounted to a baseplate that is connected to a bigger ground plate using 4 legs. All electronic components are mounted on the baseplate. The drivers, fan, lights, micro-controllers and speaker are placed in the bubble. Underneath, there is the spinning motor with a visible laser line and a sensor. The sensor is a lidar sensor (similar to autonomous car technology). It analyses the environment of the bubble. When somebody’s presence is detected, the sound of the audio changes along with the light color of the bubble. More people, results in a more dynamic sound and light experience. The Loops are accessible for all. The sensor on the laser line reacts to people sitting and standing; to tall people and children. 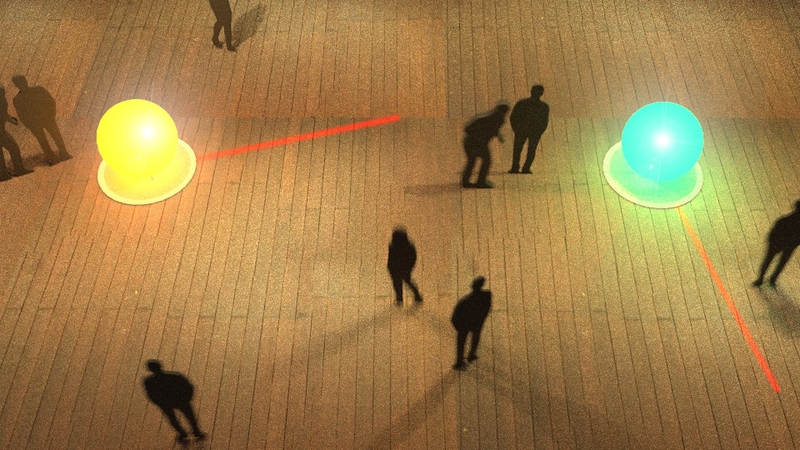 In all cases the Loops installation reacts through light and sound. The bubbles are visible from a distance. From closer, the rotating lasers are visible. More up-close the effect becomes clear. Each bubble reacts individually to the people walking around it. This makes it a multi-user interactive experience allowing crowds of people to interact with the lights and each other. All power systems are ip67 and all components are tested for extreme weather conditions. The inflated bubble is material efficient. All lights used are LED, both laser and in the bubble.